The family room is arguably the most important room in the home, and hence, the most difficult to decorate. 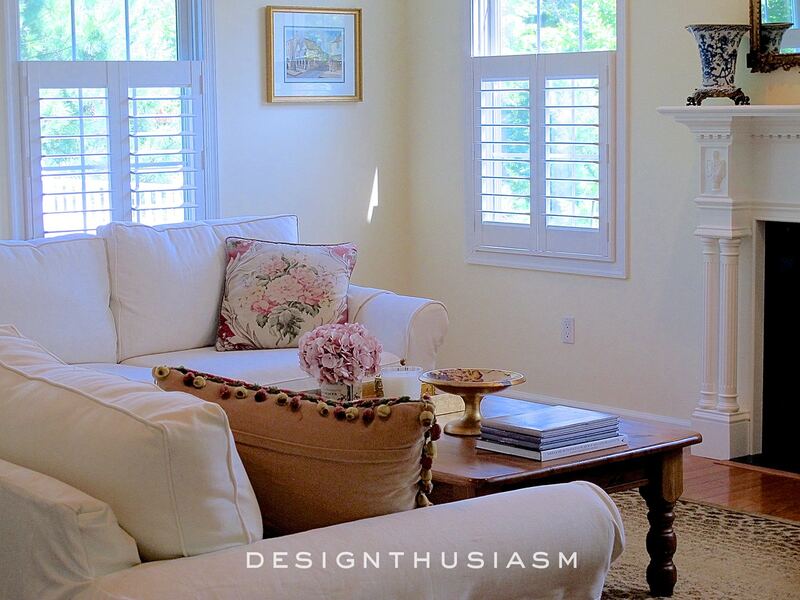 The one design challenge that everyone would love to solve is how to create a comfortable, functional and beautiful den. In our old home, our den was lovely, but we often relaxed in our bedroom in the evenings because our family room simply wasn’t welcoming enough. When we moved into our new home, I was absolutely insistent that our den function as the center of comfort it is meant to be, yet I refused to sacrifice my love of design to achieve that goal. Here are my tips for how to fulfill those varied needs with careful planning and research. The very first issue that has to be addressed is the layout of the room. Unlike the kitchen and most bedrooms, which practically design themselves layout-wise, the family room is often an open equation with many potential solutions. The key is to determine what the most common uses of the room will be and figure out your focal point based on thinking that through. For us that meant a big comfy sofa to sink into after a long day, with an easy viewing line to the television. In a room that features a fireplace on a key wall, one next has to evaluate how the TV placement will relate to the mantel. We opted to keep our fireplace as the primary visual centerpiece of the room, enhancing its beauty with a brand new mantel (you can see details of that transformation in this post) and decorating the surrounding area in keeping with its elegant feel. 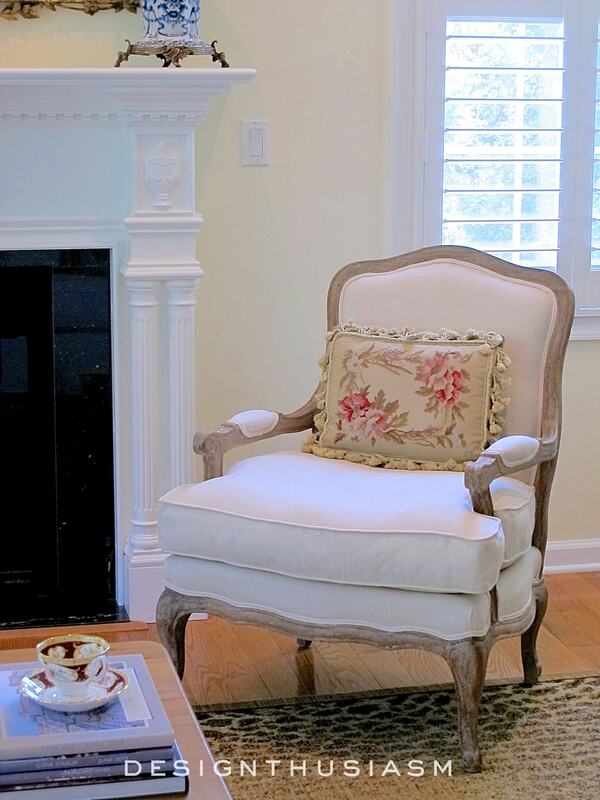 This lovely French chair provides comfort and additional seating, while the needlepoint pillow adds a note of pretty color to the pale palette of the space. This required us to then find a workable spot for the TV. Now, I’m not a huge television fan, but Mr. Designthusiasm is quite another story. Hubby likes to watch TV from pretty much the moment he opens his eyes, so for this room to satisfy both of us, the screen needed a place of prominence. 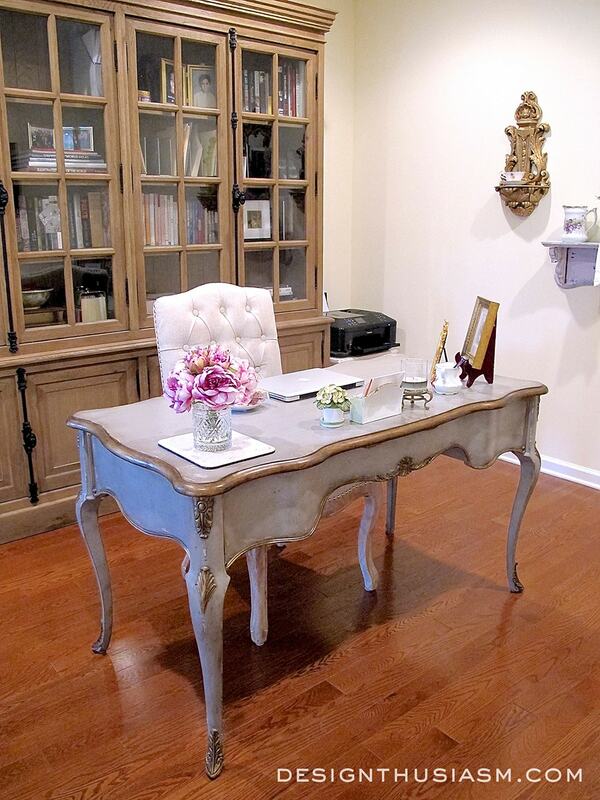 Rather than hiding it in a bulky armoire, I decided to embrace the technology and make it an integral part of the room. 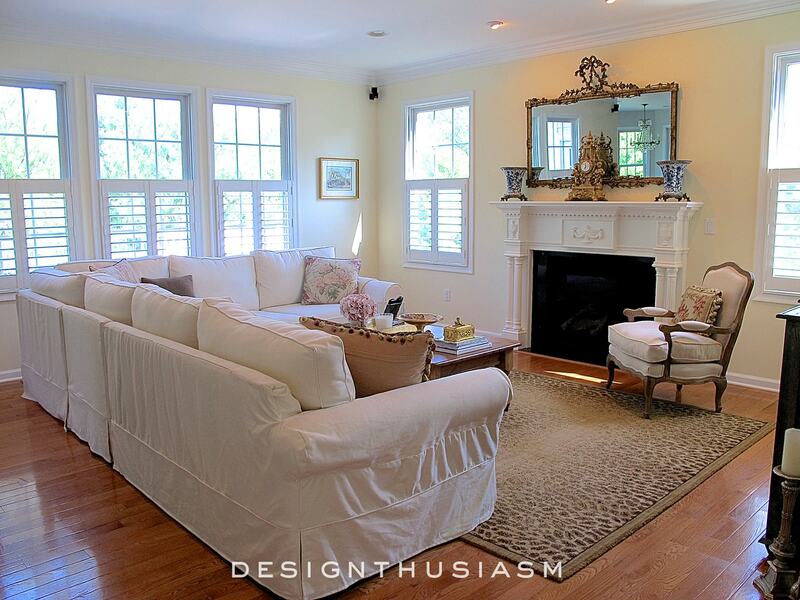 The huge sectional sofa manages to simultaneously face the beautiful fireplace and the ugly entertaining TV. With such a large sofa dominating the room, there’s not room for much else, but I always like to add some small decorative pieces to help give the room character. 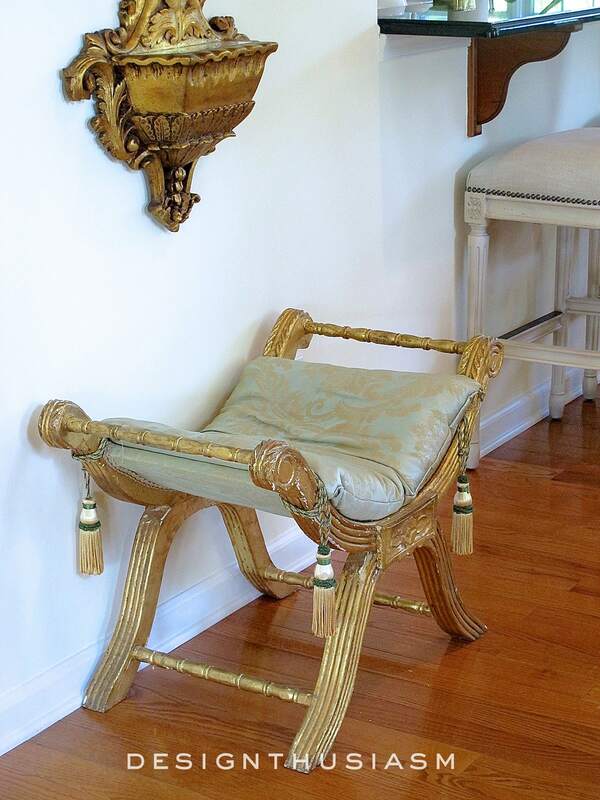 This antique gilded bench rests under a carved mirror and is just the touch of elegance the room required to take it from banal to lovely. I also added this wonderful iron sideboard to house the electronic components. We had holes drilled through the back to accommodate the wires and left just enough room between the console and the screen to showcase a few decorative items. 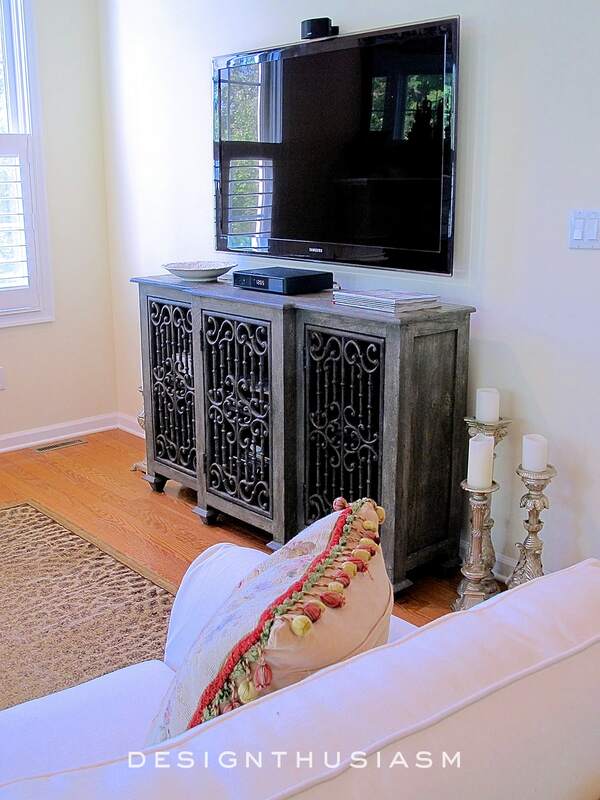 The open grillwork front allows the remotes to work the equipment. 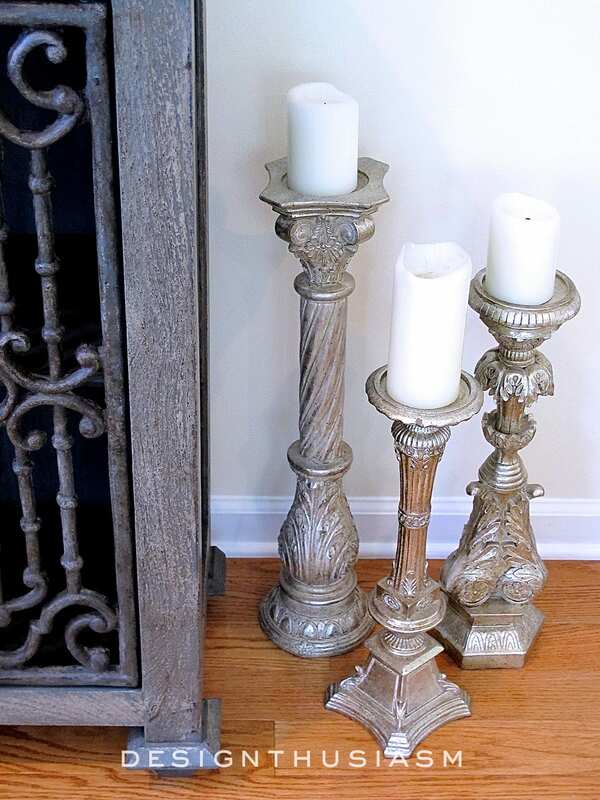 I wanted to be careful to keep the embellishments in the room clean and streamlined, but these gorgeous candlestick holders make a classic statement, flanking the sideboard. Atop the sideboard I added some photo books I had created with pictures from our travels, a delightful way to personalize the room. While I was insistent on comfort and functionality, I was also uncompromising on sticking to my go-to color scheme of light clean colors, with gilded and French decorative accents. The pale custard wall color envelopes the room with a warm glow and the cream seating makes the room feel light and happy to me. The sofa is slipcovered for ease of cleaning and we never hesitate to eat in this room. 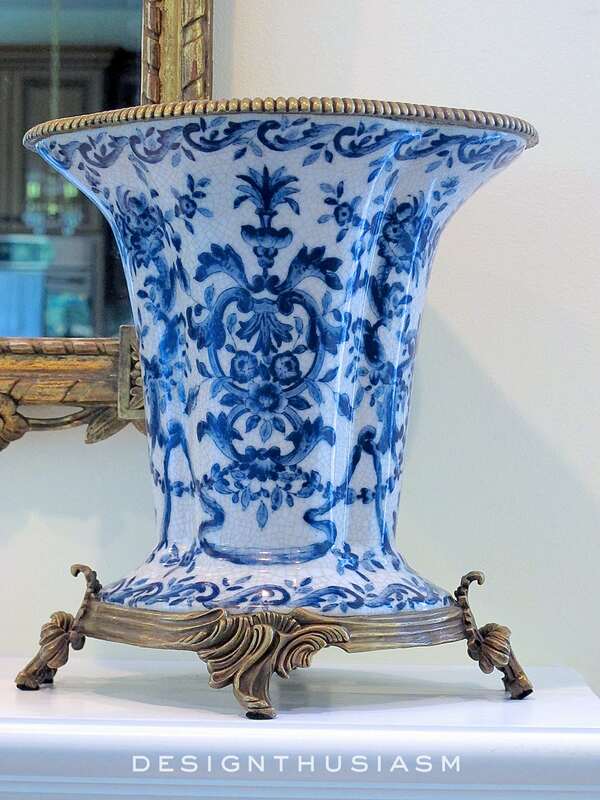 I really had to resist overdoing it when styling the mantel, but I wanted to be sure to be able to see these stunning vases without much distraction. 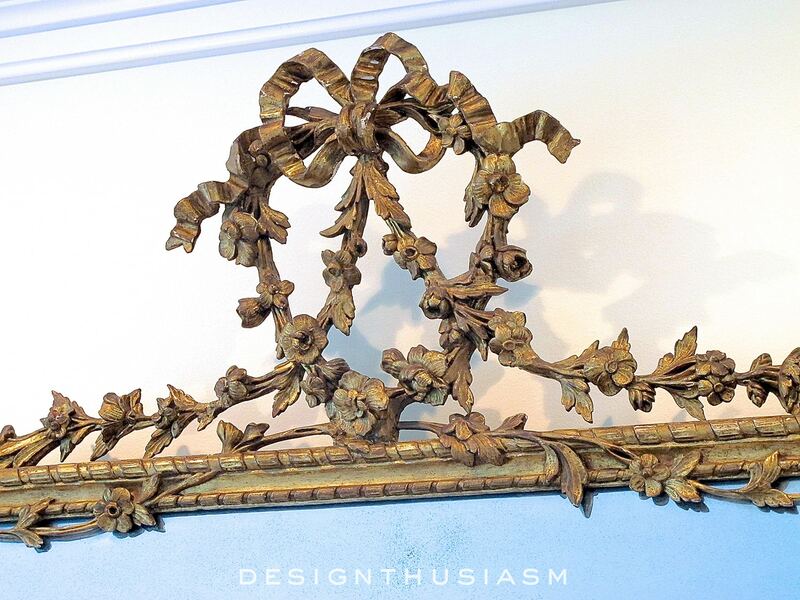 Another vintage French piece, the mantel mirror has exquisite detail. 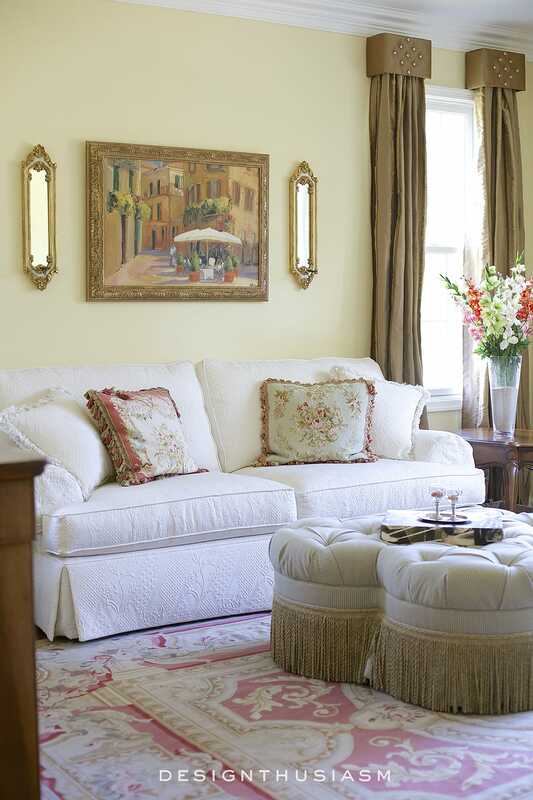 Essentially, my formula for this room was to find plush comfortable seating and a huge TV, then add gorgeous French details as one would add jewelry to a classic outfit. Any comfy sofa can benefit from soft throws to wrap oneself in and lush pillows to curl up against. This one from Ralph Lauren bears a favorite floral pattern. 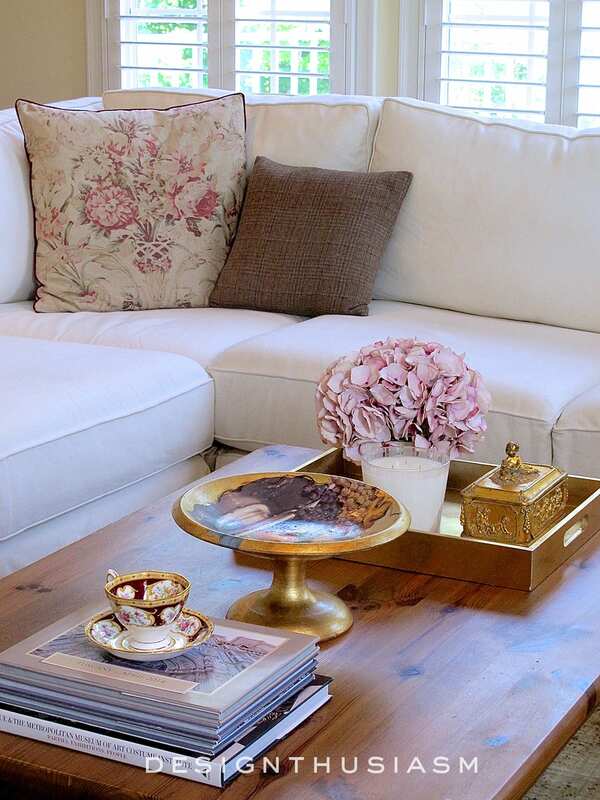 The coffee table offers an opportunity to display accessories that add both beauty and functionality. 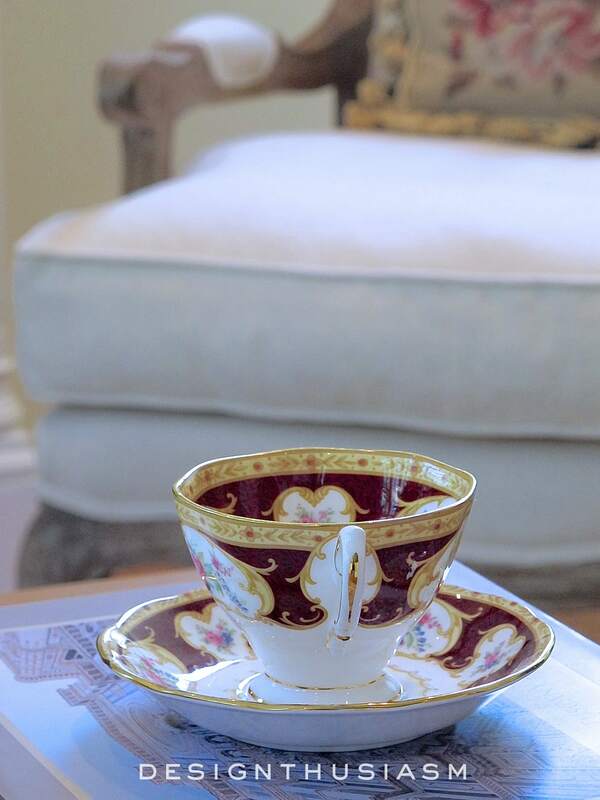 I love to nestle in the couch with a book and a cup of tea, and this teacup is one I love from Royal Albert. The candle on the golden tray adds a heavenly scent. A gilded Italian serving dish sits at the ready to present sweets or other snacks to much on. I just love the way the light streams into this room and I knew I wanted to capitalize on that. 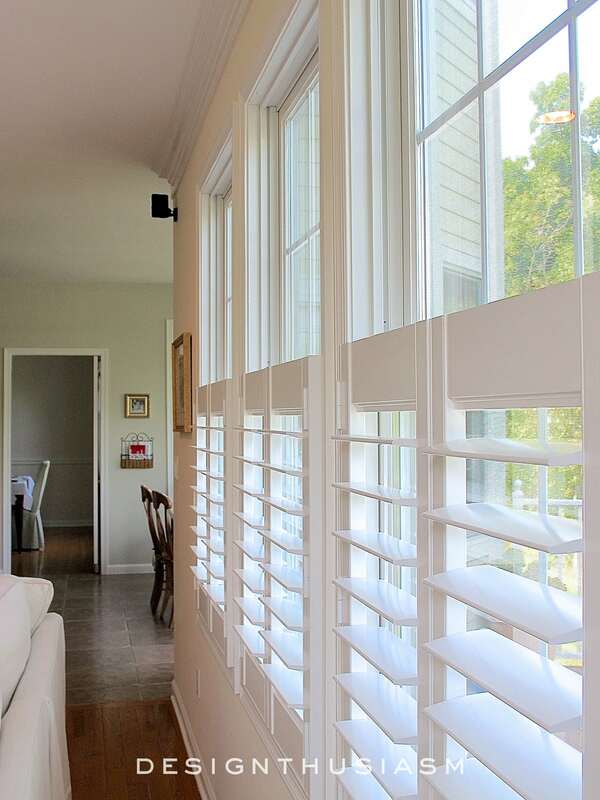 The white plantation shutters keep the sun streaming in, while conveying a feeling reminiscent of a vacation home. Our den connects to the kitchen with a bar counter divider. 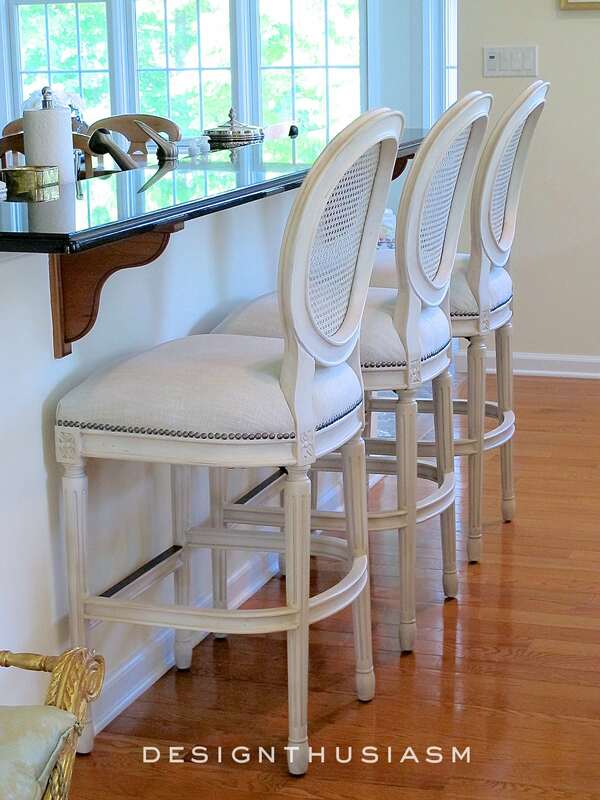 French cane back barstools maintain the themes of beauty and comfort. 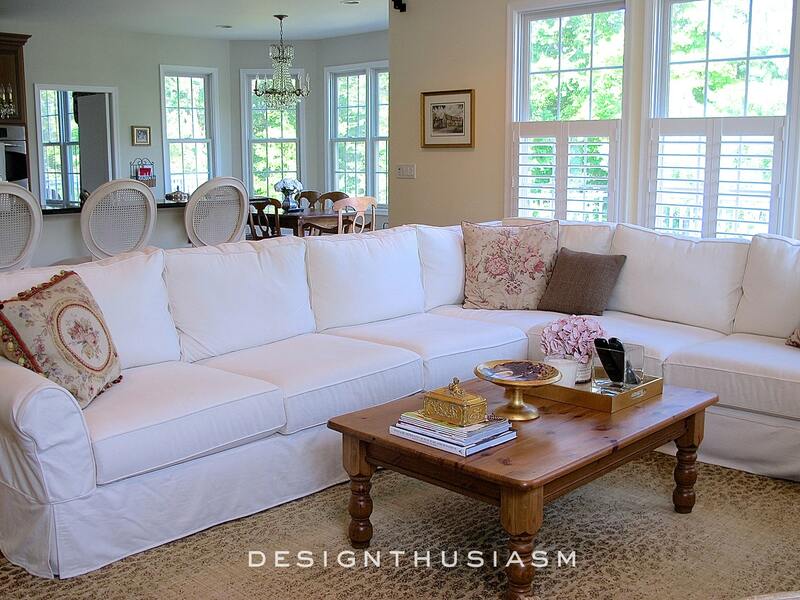 An assortment of throw pillows dances across the expanse of sofa. 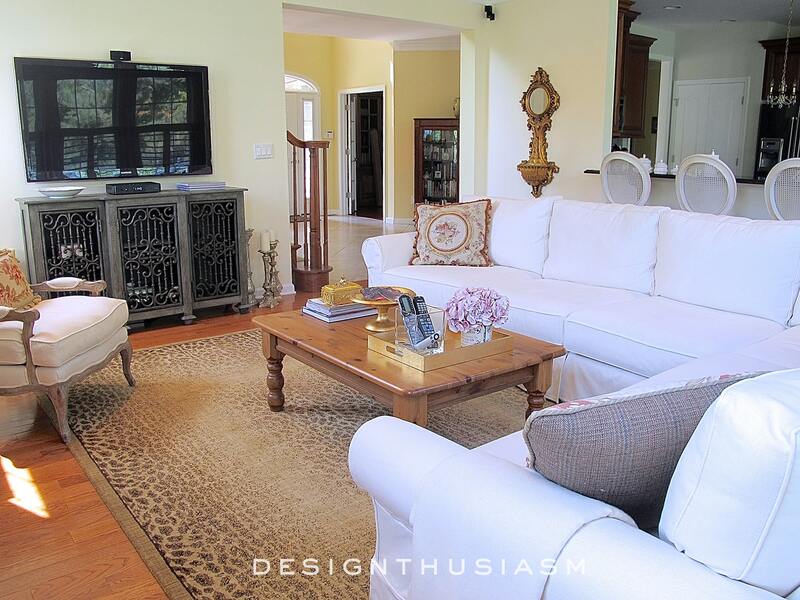 The subtle leopard patterned rug serves as the perfect underpinning for this light but warm toned room. Our den was the room that took the longest to complete (apart from the rooms requiring actual renovations), but we’re delighted with how it tuned out and we truly use it every single day. There might have been several layouts that would look more lovely, but none that would function for us quite as well as this one does. Gorgeous! Every bit of it! 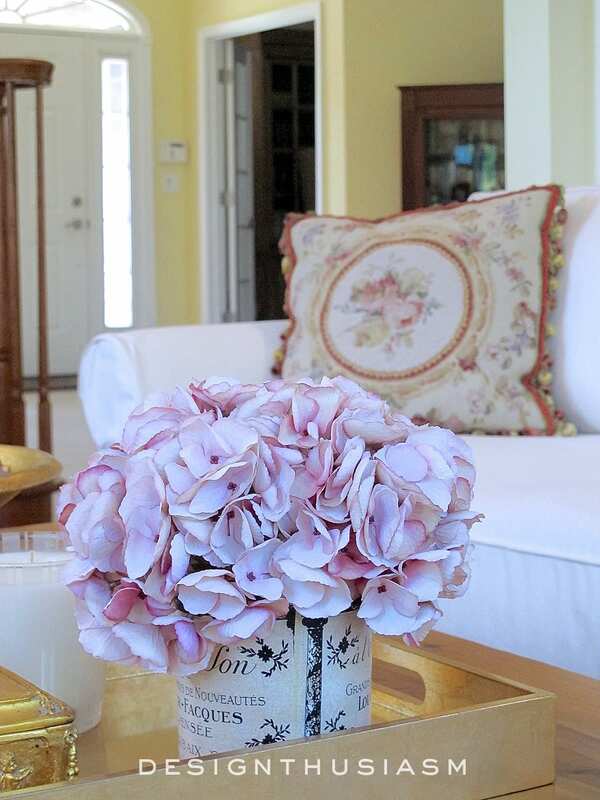 Hi Lory ~ I really enjoyed seeing how you styled your family room. I think it’s PERFECT both in functionality and with French style to please the eye. I also enjoyed learning where you purchased the major furniture pieces. One question I have ~ where did you create your photograph albums? They look like nice ones. I would like to do something similar with our trip photos. Thank you for sharing this beautiful room in your new house. I’ve been looking forward to each new room as you complete it and share it! Have a great day!! Oh, thanks so much, Leila! The photo books were done through iPhoto and ordered direct from Apple. I actually was thinking of doing a post on the books themselves, because they’re something I really enjoy doing. I’ve also done a few gift books for people and they’re always received with gratitude… 🙂 How nice that you look forward to the room reveals. That’s such a nice thing to say! 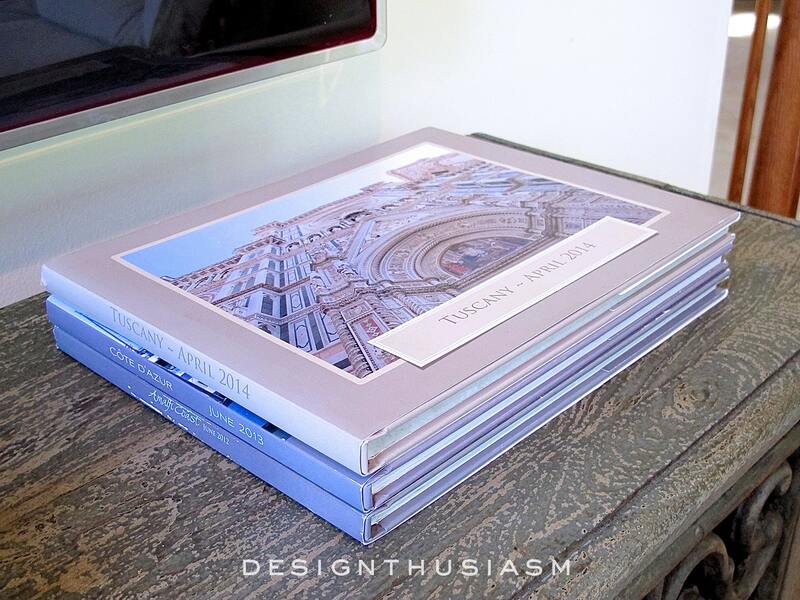 Hi Lory ~ Thanks for your info about the photo books. I tried my hand at creating a couple of them but this was back in 2009 and I had a lot of help from the CVS photo clerk (LOL)! I haven’t tried making any since that time so I know I’ve forgotten what I learned in that one afternoon. I just remember there were different fonts to choose from for the captions, different background patterns and different ways to position the pictures. It was fun but I would love to learn again from a pro like you! If you decide to write a post about the books, I WILL read it! Continue to have fun setting up your new house. I look forward to your decor for the upcoming Holidays! This is lovely. I am a huge fan of your paint colors. They add so much but they don’t ‘take over’. Thank you for sharing another beautiful room. Thanks, Elizabeth! I’m so glad the paint colors resonate with you because they took me forever to pick out… 🙂 Thanks for visiting! I love it! Functional, comfortable and elegant…you’ve just shown us that a room can be a cozy, family friendly space and still be beautiful. It is exquisite in every way! Your room is beautiful! I’ve been looking at Pottery Barn sofas. 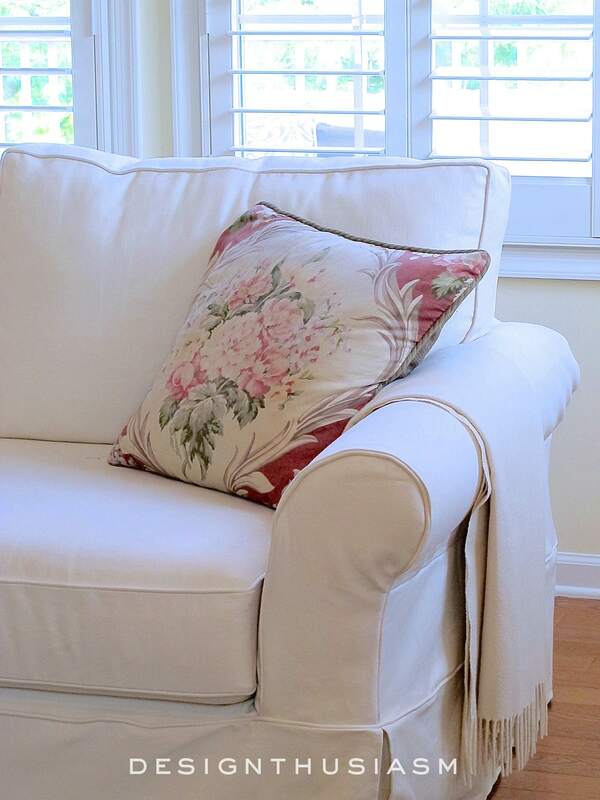 Is the slipcover on yours white or cream? Thanks! I am loving all your gorgeous details. I wish I could have more white furniture but with my boys and a dog, I really can’t at this time! Beautiful home! I love this room. Very pretty and inviting. 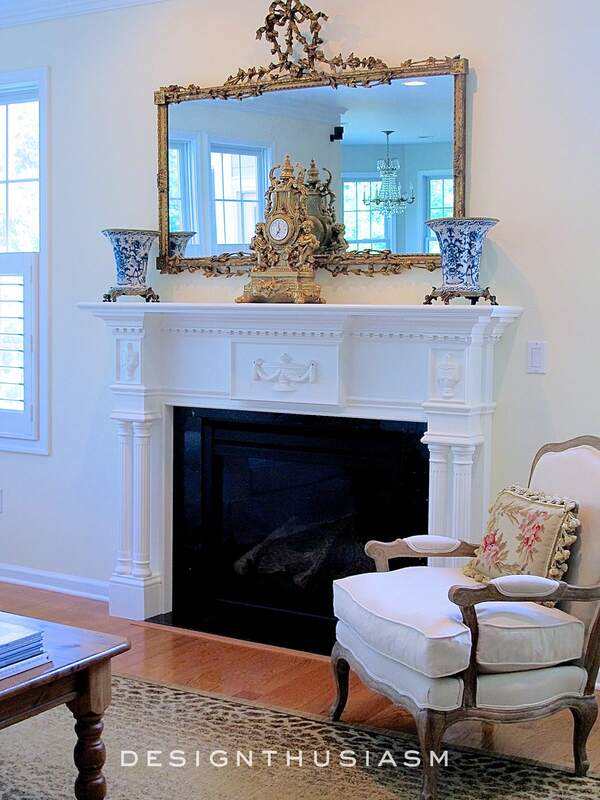 Where are your mantel vases from? Thanks, Mary!! The vases are from Tina at My Enchanted Home. I just love your simple classic elegance. A touch of gold is what every room and girl needs. Yet again, another beautifully thought out space! I love it! Thanks for sharing! The room turned out absolutely beautiful! !I love the mix of patterns, especially the florals which are my weakness. I to have the large flat panel tv in my den, and I was wondering how you dealt with the sub woofer – that heavy black speaker is driving me nuts! Thanks, Liz!! Yes, it’s nice to find people that still love florals… 🙂 I truly believe they have a place even in more modern or transitional decor. As far as the speakers, I look at them as a necessary evil, because I am a huge music fan. It helps that the system has small speakers, so they don’t really bother me. I’m not sure which the subwoofer is, but we just have the small one that I have centered over the TV and then we have 4 more mounted, one in each corner of the room. Everything else electronic is tucked away in the console unit that I had my handyman drill a hole in the back of for all the wires. The room gets surround sound which is cool when watching movies and, of course, it’s great for music. It’s a Bose system used with Sonos. I love it! Elegant and functional, amazing! The strong classic pieces really carry the room. 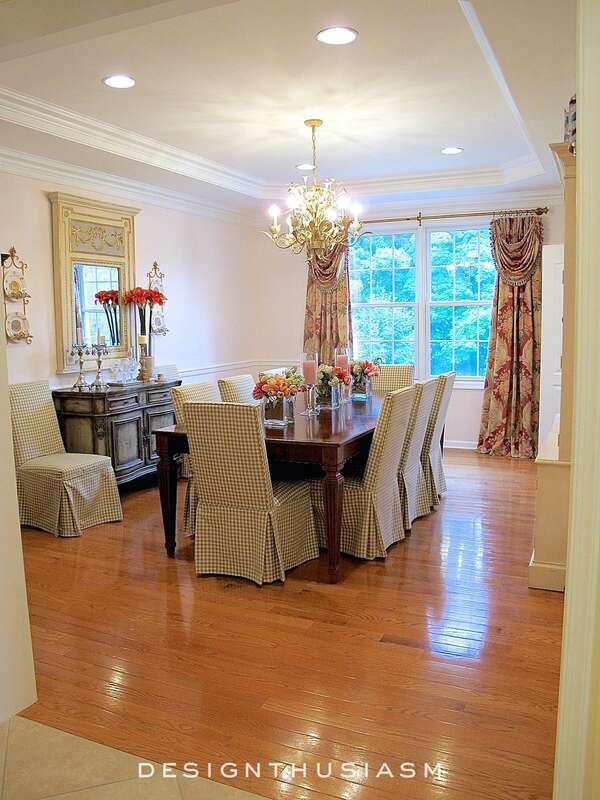 I am looking to add a mantel in our dining room. Where did you purchase your mantel in the den? Love, love, love your decorating! around a TV. Thanks so much for sharing….everything turned out beautifully! Thank you so much! I still don’t love the way the TVs look, but might as well embrace them, right… 😉 Thanks for visiting! !